Are you tired of being exhausted? Do you miss the feeling of being energised and excited to face each day? Or perhaps you're feeling a little off balance, like something is missing; and you've tried to work out what, but haven't been able to do it on your own? Our coaching is designed to get you crystal clear on what optimal wellbeing looks like in your life (ie how you'd like to feel each and everyday). This ideal state of wellness is different for everyone. We traditionally think of health and wellbeing in the form of our physical body, and usually as a specific weight, however wellness is much more than a number on the scales; it is also about how you feel and how you manage life events and circumstances. Your ideal picture of wellness, for you, may be about how you manage stress or your mind set, in addition to what you eat, when you sleep and how you move. It may be about having more harmonious relationships, or strategies to bring you back to an even keel, or something else altogether which impacts how you feel and function in your day to day life. In coaching we get clear on what you want and explore the possibilities and what's stopped you before; we then set the steps to close the gap between how you're living now and how you want to live your life. For coaching to be effective you need to be ready to commit to making a real change, and you need to be willing to be honest with yourself and to scratch below the surface. If you're ready to do this; to start living your life more fully, each and every day, give me a call to have a chat about how we can work together. There are an abundance of coaches around and it's a reasonable investment to sign up for a program, so give me a call and see if I'm the right fit for you. We can chat about the process and what you'd like to achieve and you can ask any questions you have about the program. Pre-coaching questionnaire to reflect and take stock. 1 x 90 minute Coaching Session where your vision of optimal wellness begins. You'll develop a sense of how your life will look and feel, based on where you'd like to focus. Whether it's nutrition, exercise, a positive mind set, a balanced work and life, or something else that will improve your wellbeing. 4 x 60 minute Coaching Sessions to connect back and reflect, review, refine and re-focus you to move closer to your goals. We utilise your strengths and explore options to navigate challenges. We’ll celebrate your successes and make clear commitments to the next steps so you stay on track and accountable, to move forward. Additional support as much or as little as suits your style - coaching workbook, goal setting templates and worksheets, suggested reading, journal exercises, customised meditations, email support. 1 x 90 minute Coaching Session face to face or by phone. Want to know more about my coaching? Why a coach? Can’t I just do it on my own? Well you could, but take a moment to consider how that's worked out for you before? Have you found you make a start and all goes well for a couple of weeks and then life gets in the way; work or home is busy and stress levels creep up and you lose focus, along with your resolve. Note, this is very normal. You might then find old patterns and beliefs rear their head, taking advantage of your drop in energy and focus and you revert back to your default mode and old habits and behaviours. This too, is very normal. You may then notice it's the end of the year and you are reflecting and realise nothing has actually changed; you still want to improve the same aspect of your life or yourself, but it's been super difficult to keep yourself on track. You might then pledge to start again in the new year; and the cycle continues. It's not just you, this is a common situation we face when attempting change and life gets in the way. A coach helps keep you on track and maintain your focus. You also have someone to be accountable to which makes a significant difference in how you progress towards and sustain change. When you have a coach by your side you have someone to guide you in becoming crystal clear about what it is you want to achieve. A coach helps you find your motivation and in the process teases out why it’s so important to you, which is one of the critical explorations enabling you to continue to stay on track and move forward. With a coach you’ll move towards your goals with more speed and clarity, as you have someone you're keeping yourself accountable to and also your very own cheer squad to play back what you've achieved and acknowledge your successes. A coach is in your court at all times and can shine a light on your blind spots and reflect different perspectives, helping you to move past blocks and to persevere when the going gets tough. Do you find it hard to stay motivated and keep believing you can achieve your desires? A coach will help you see your strengths and notice all the progress you've made that helps to keep you motivated to continue. As your coach I will keep you on track with motivation and inspiration, and provide fresh perspectives on navigating the bumps and turns along your path to greater health and wellbeing. I’ll ensure you’re clear on what you set out to achieve from the outset and each session thereafter, with each session resulting in clear actions for you to take towards your goal. Still wondering if coaching is right for you? Do you know deep down you need someone to hold you accountable? To set you down, to guide you to focus and get all your ideas and dreams out of your head and on to paper? As your coach, this is where I start. My experience has been working with people to flesh out clear objectives and how best to achieve these, in a specific time frame. I’ve used these skills to manage people and projects, to achieve desired outcomes with sustainable benefits in my professional life. I’ve also worked with a coach long term to achieve many changes in my life, including a healthier relationship with food, changing careers from a Finance professional in the corporate workforce to self employment in the wellness industry and setting up a business along the way. I have no doubt these changes have been fast tracked and maintained due to the attention they receive and the insights I gain from my regular sessions with my coach. If I hadn't set aside that time and made the investment and commitment to turn up to my coaching sessions I would still be ignoring my emotions with food and dreaming about my passion to help people in a more meaningful way. There's something about paying someone to be your coach that makes all the difference. I had tried to keep on track with myself and with friends but it was the coaching that has been the game changer for me and I believe it can be for you too. As your coach I can give you tips and share what’s worked for me in managing my health and living life with purpose. I believe there’s no one size fits all; it’s about finding what’s right for you; so I will support you and guide you in finding what that looks, feels and sounds like in your life. I want you to feel good ‘most days’ because for some of us it’s near impossible to feel amazing everyday. And on those days you’re not jumping out of your skin, I can share strategies and practices to help you get through and bounce back. Just like a personal trainer works with you to shape up your physical body, as a wellness coach I will support you with your physical wellbeing, in addition to your mind state. As someone who has experienced many of life's challenges, I get how hard change can be. This is how I can empathise with you and support you in finding your own way. I won’t judge you but seek to understand what’s driving your self-sabotaging behaviours and what fuels your motivation and desire for change. I'm guessing you are educated in knowing what you need to do to feel better but it hasn’t been enough to make the changes you want. Your mind gets in the way and maybe you beat yourself up about not being able to do something which on the surface looks and sounds so simple. This is where coaching helps you draw on your strengths and get to know yourself a little better, to make the changes you know will shift the dial in your wellbeing and your experience of this life. So am I the right coach for you? Give me a call for a chat, or continue reading more about me. My life experience has given me a gift of compassion and a reasonable understanding of the various struggles we all face. From caring for my terminally ill mum, as a teenager, to running the household while studying and working part time, watching my beautiful, young mum pass away at just 43 years old. From this experience I learned to appreciate health isn’t only nutrition and exercise, but is also affected by mindset and emotions. 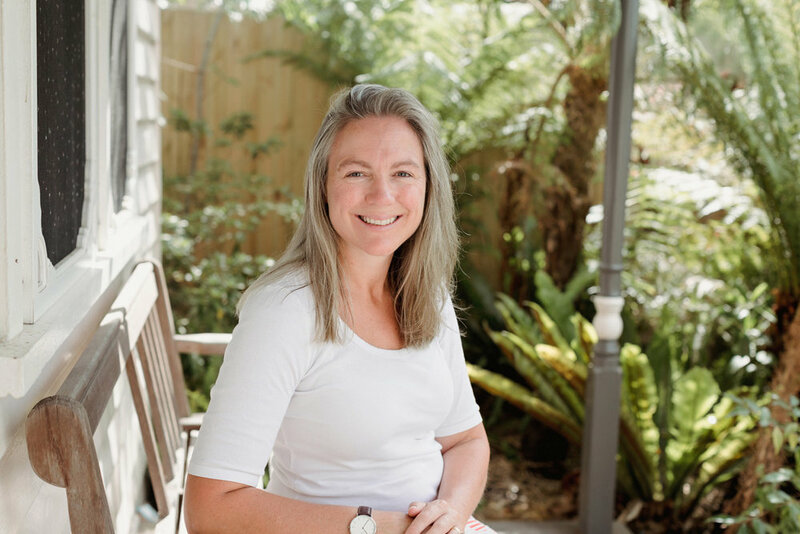 I continued to balance study, work and home life from 20 years of age, then began working in corporate roles, in Melbourne's CBD, commuting with early starts and late nights. I had my 2 babies, now cheeky teenagers, and continued my work in various Finance and Project roles in the city. I can relate to the exhaustion that comes from not enough self care and too much time working and supporting others. With my children being born 15 months apart, I know first hand how challenging it can be. I was pregnant and working, then off work with a new born and breastfeeding before back to work eight months later, pregnant again, and on maternity leave once more, before heading back to work, this time with a baby and toddler in the mix. I joke it took me 10 years to recover, but it's the truth and that was way too long. I wish I had a coach back then. I clearly remember the subtle, low level flatness I lived with, struggling to get out of bed in the mornings, completely spent from the busyness and constant go, go, go my life was. I remember stopping at traffic lights and all I wanted to do was close my eyes and get some sleep, completely depleted of energy. I also have an appreciation of caring for a child with a chronic illness and living with the worries and anxieties this provokes, along with the physical exhaustion from sleepless nights and broken sleep, over many years. My meditation and yoga practice has been the biggest shifter in easing this anxiety for me. I help clients with simple meditation techniques which help to ease the anxiety many life situations can promote. So I know what it’s like to try to be superwoman, constantly striving to achieve, without any real conscious decision to do so and then feeling completely exhausted and emotionally flat. I also know how it feels to be more fit and healthy in my late forties than I was in my thirties, and possibly even my twenties. I’ve worked through years of soul searching to establish what I’m passionate about and what gets me out of bed in the morning. I am no longer overwhelmed before the day even begins; and I’ve experienced the importance of self care and investing in myself to be more available and present for others. This is why I coach; because I have experienced first hand how beneficial it is and the shifts it creates. I have always loved working with people and supporting them to achieve their goals and I've done this all my life, in many different ways. If you think coaching is something you will benefit from and you'd like to have a chat to see if I'm the right coach for you, please feel free to give me a call or drop me a line, anytime. My wish is for you to flourish in good health and wellbeing, and to live your life fully.